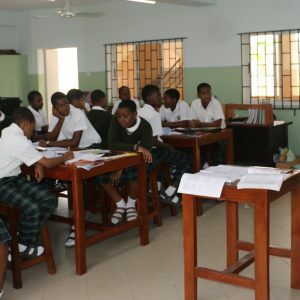 Students in each year are normally divided into 4 class sections labelled A through D. A class teacher is attached to each section and remains with it for at least one academic session. There are 3 opportunities for class teachers to meet with their students on a weekly basis. a. Daily (Monday – Friday), during morning registration. b. Weekly Examen, Guidance session. c. Weekly, during Personal and Social Education (PSE). Class teachers are responsible for the pastoral care of all the students in their class and try as much as possible to get a true portrait of each student so as to enable them make useful reports (feedback) to the principal and their parents. They constantly monitor the behaviour and work of each student and try to see that their classes obey the rules and regimen of the college. The class teachers are the school’s first line of support in the pastoral and personal care of each child. Parents/Guardians are encouraged to maintain regular communication with their ward’s class teacher. The class teachers are also an extension of the counseling department. Subject teachers are divided into faculties, each run by a head of faculty. Faculties are divided into departments to encourage team-teaching, collaboration, peer-to-peer monitoring and mentorship. The Heads of Faculties (HOFs) and Heads of Departments (HODs) organise regular departmental and faculty meetings and also meet with the Vice Principal Academics as a group and on an individual basis.